Our Internet has been playing up, again. Nothing unusual but it is frustrating as we are dependant on it for work and keeping in touch with life on the other side of the mountain. I have a feeling that part of the problem is that we are on the most basic tariff, the one where you are paying for just one hamster (probably quite an elderly one) to run round the wheel, which then generates whatever it is that gets the Internet inside the house. I also have a feeling that Antonia and Paco share the hamster with us. If our Internet isn’t working, theirs generally is and vice versa. My other thought is that possibly our Internet hamster has gone on holiday – July/August seems to be one long holiday here. Take our Post lady for example; she’s been on holiday for weeks. Before she left she told us that any mail that came for us while she was away would be left at the bar. ‘No problema, that’s coolio’ we said and then remembered that when we say coolio it’s often mistaken for culo which means arse. In these days of electronic mail it’s a rare thing to get proper post. Like most people, the only paper mail we generally receive is letters from the bank, bills, credit card statements, that sort of thing, so we were totally coolio about our Post lady going away for her holidays and never gave our mail another thought until that is, Irishman ordered a rather snazzy new shirt on-line. The Parisian shirt company promised to deliver the shirt by Fed-Ex to our door. Quelle surprise then when I received a message out of the blue on Facebook from my hairdresser. ‘Hola lottie tengo un paquete en la peluquería para peter. Yesterday morning I was doing some drawings when I heard ‘Little Jose’ at the door. 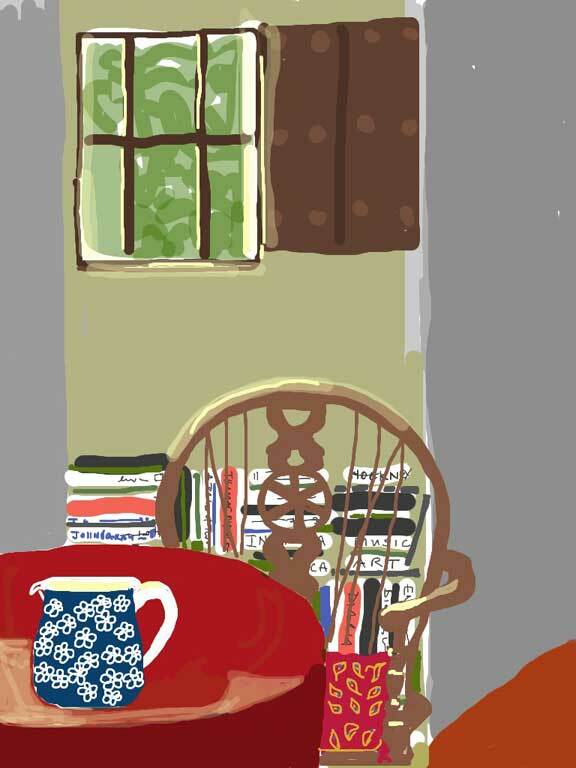 ‘Come in’ I shouted putting down my pencils and paints. ‘Little Jose’ excitedly produced a postcard from his pocket. ‘It’s from Malta’ he said showing me the stamp for confirmation and then the picture on the front. He was most animated, excitedly pointing to the picture and then seeing that I had paintbrushes in my hand, took it upon himself to read out the message that was written in English on the back. It was then that the penny dropped and I realised that the postcard was for us. 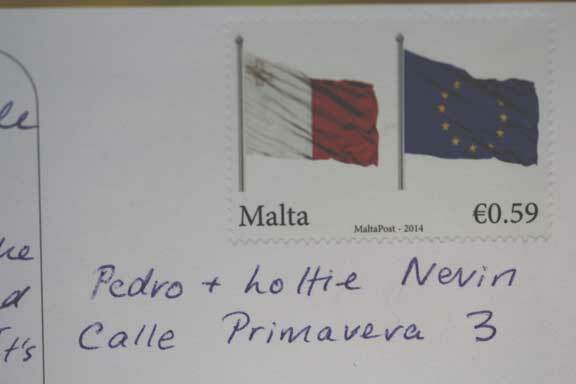 After ‘Little Jose’ had left, it did occur to me that our postcard from Malta may very well have done the rounds in the village before being delivered to its final address. At this time of year, not a lot happens in the village so you can imagine that a postcard from Malta is considered a huge event. The marvel of Spanish mail is that regardless of whether or not our Post lady is sunning her self on the Costa’s, thanks to good neighbours our post always gets here in the end albeit not via a conventional route. Delightful! And man, do I love those paintings. Well, of all things. Life does get exciting in your part of the world. Very intereresting that Pete actually got his shirt. Here, if that sort of thing had happened one would likely never see their shirt as it would have been heisted along the way. 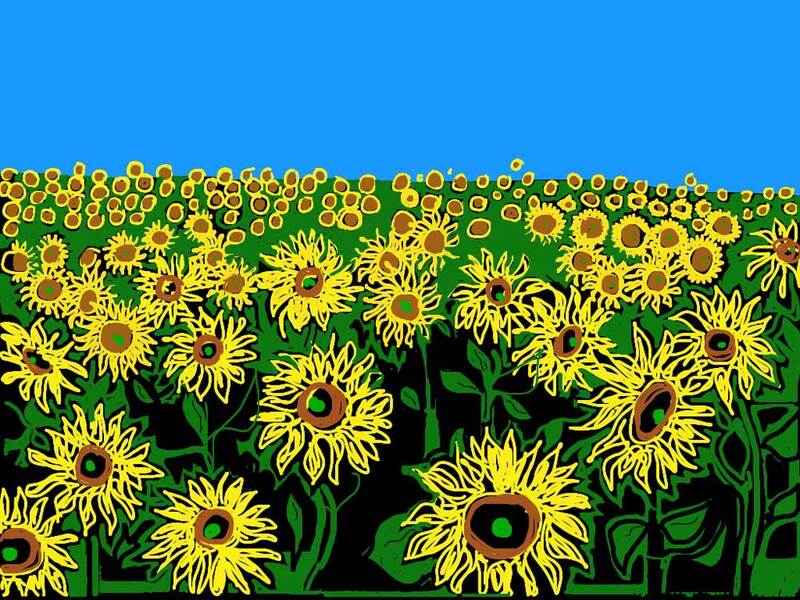 I really,really like the paintings and I suppose the sunflowers are my favorite. Loved reading the story. I’m intrigued with the village life- Internet and mail. I’m not sure if you ever got the short note that I sent you last Friday. I am mending slowly and still pretty weak from my ordeal of 7 days ago. Pacemaker seems to be helping some. Will email you maybe today or tonight if I feel up to it. Yes, the mail system here is interesting. Fortunately we get so little mail that it’s no biggy as they say but I guess it would drive me nuts if I needed speedy delivery for my business or something! Maybe I should send a few postcards to keep the village entertained for months Lottie.It’s strange to thing of the postwoman going on holiday and there being no replacement. Maybe we could try that here just before Christmas when the gas/electric bills are due again. I hope’Pedro’ liked his new shirt when he finally saw it. I think that is a splendid idea about post and Christmas. That said, one of our christmas cards took 6 weeks to get here – arrived in time for my birthday in fact. Poor Annie was most upset. Pedro did like his new shirt and judging from all the admiring glances, so did everyone else. Please send us some postcards, we’d LOVE it and you’d keep ‘Little Jose’ and anyone else who chanced to read them, entertained for months. Send me your address by email mikproju@talktalk.net and I’ll send some cards to keep the locals happy and hopefully to remind you of Wales too Lottie. Keep an eye on Pedro and the source of the admiring glances, especially if he orders more shirts. Ah Lottie, I love your drawings! The sunflowers is my favourite one 🙂 The post service sounds like ours here in Jimena. My man marks scripts for the IB exam board and a few years ago we used to get them delivered here, but changed that to the school after ‘goat-man’ as I call him casually handed the scripts the Fed Ex man had given him earlier (that day?! goodness knows when) over the back fence to us, much to our surprise as we were chilling out with a bottle of wine! You are delighting me ever more with your paintings. My envy knows no bounds. I have your hamster’s Greek cousin, as you probably guessed! Thanking you kindly, Puff. Very tickled that you like them. I’m going off to Hamster Headquarters today to demand a new hamster – enough’s enough. Specially since we’ve just discovered that we are not in fact on the most basic tariff – we should have 1,000’s of hamsters turning that wheel, not the ‘slug’ that’s currently employed. Here’s a thought before I go back to bed and try to get some sleep….what came first, the hamster or the wheel?…..
You are roughing it a bit, aren’t you Lottie? But I know that you love living this life regardless. When I come to your blog, I am often a bit jealous because it seems like such a laid-back, peaceful life you have with Irishman and Snout. Anyhow, hope the shirt fit and all is well with your internet. I think, dear Biker Chick that you’ve hit the nail on the head. It is indeed laid-back here, muchos laid- backio. Maybe that’s why our lazy Internet hamster takes things so easy? ‘what’s the rush’ he says – why the hurry? The wretched beast is getting the sack – In my book, there’s a fine line between laid-back and down-right idle. As for roughing it, well yes the early days were a bit grim but now the summer is here and things are starting to take shape it’s like heaven and yes, I do absolutely love life here. I feel very content. I’m really just a simple country girl at heart! I love receiving snail mail, and have been writing to a Twitter friend of mine over the last two years. It is nice of your post lady to actually tell you she is going away. Our postman/women change so often we have never gotten to know them, and soon we will no longer have home delivery and have to pick up our mail in so called “big boxes”. Picking your mail up from Big Boxes? Ahhh, that’s no fun at all – shocking in fact. It was nice of the post lady to tell us that she was going away – I wish she’d send us a postcard though, I’m longing to know where she’s been all these weeks and of course it would provide hours of entertainment for us all. Clearly our little village in the hills manages regardless of whether there’s a post person or not. Just word of mouth, a little help from Facebook, the odd trip to the hairdressers and Bob’s your uncle – service as normal. Word here is that we are only going to get mail delivered three days a week. I say how will that be any different to now? Our postperson seems to only show up when it suits them. Paintings as always, are lovely. When I was young, in the olden days as my kids call it, we had 2 post deliveries A DAY! can you imagine that happening now??? but 3 times a week? that’s just crazy, Trish. Imagine trying to run a company with such an inefficient service. I suppose more and more of our postal stuff is done through delivery companies and couriers but even the Fed-Ex man let us down. Thank goodness for good neighbours, we’d be lost without them. Very nice story and paintings Lottie. 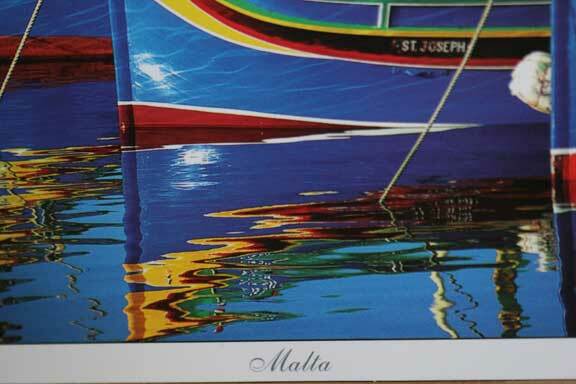 If the village is overexcited by a post card from Malta, what about one from Australia? (the only one in the village!) 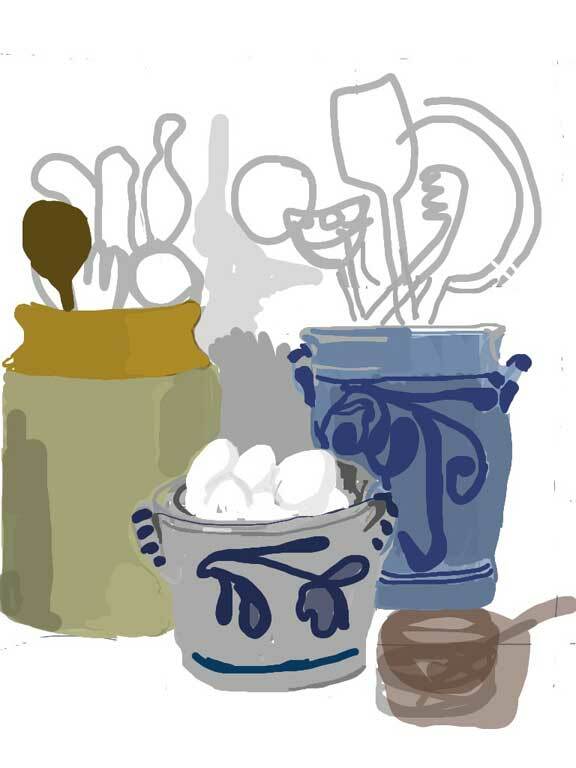 H and I like the Delft blue, pots and eggs painting most. Instead of ordering a shirt I think a box of hamster steroids is in order. Or, just think, another hamster so they can make their own replacements. The paintings are very appealing, Lottie. Where do you market them? You could do a blog auction of the sunflowers. How big is it? I’ll bid €100 to start you off. Can you imagine, a whole load of randy hamsters making out in the wheel – they’d be so busy copulating that we’d be lucky to get any Internet at all….No, I’m going to stick with Plan A – go down to Hamster Headquarters today, give them a bollocking and find a replacement. I like your idea of the steroid enhanced hamster A LOT. If I thought that the Internet was bad in Indo, hah! I didn’t know the half of it. Nothing like a change of hamster to make things better, eh Lottie? Wow ! You’ve got hamsters, I’ve got an elephant ! It’s not cheap but in the mountains it works well. 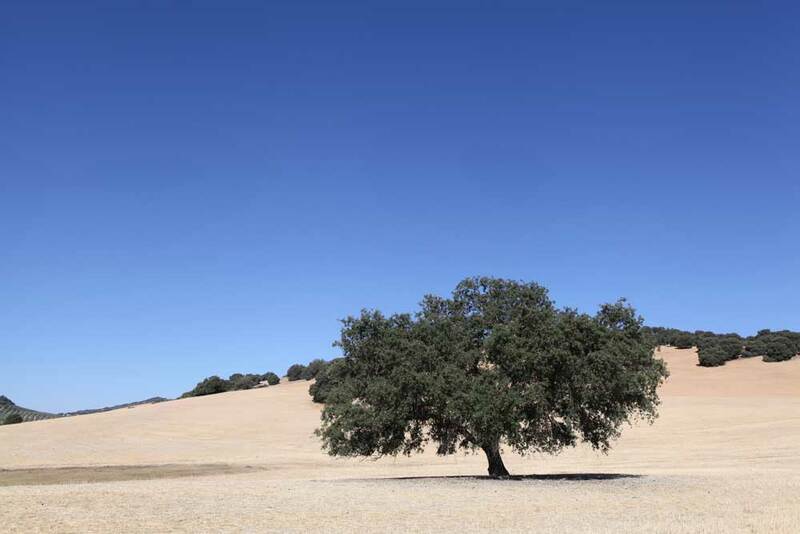 Iberbanda, 3Mb, free installation, phone with local free & 500 minutes pm free to UK, around €50pm. All my friends here use it as well. Ah, Correos ! Normally is good, direct to the door, but all hell breaks loose when a stand-in for the local posty takes over. I used to end up with most of the expats mail in my box. They have now an automated system. Empty milk 6 pack boxes with names on for outlying residents to come in and collect their mail. If one doesn’t live in the village Fed Ex etc. drops packages off at a bar to be collected. I think your hamster needs a lady friend to show off for. For some reason WP stopped letting me know about your posts – I just restarted it with a new email following so hopefully I will get your next post. Your renderings are very nice indeed, what program do you use on your iPad to make them? Did the new shirt fit ok? Nor do I 😦 I borrow Pete’s!! The sunflowers piece is stunning and I also really like the tree landscape photo. Probably a good thing the motorbike courier didn’t materialise, it could have encouraged an unsustainable online shopping habit. ← A Wing And A Prayer – A Swallow’s Tale.